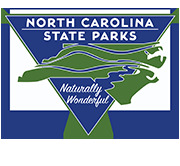 Support North Carolina state parks with a license plate. There is a $30 fee in addition to regular license fees ($60 for personalized plates). Funds go to the Friends of State Parks to support state park projects and initiatives. The plate is now available on the N.C. DMV Web site.